focus on transformation and change. The Hon. Minister once again recommended the University to become more efficient at what it does as he strives to seek new funds for the University. Ms. Julianne Pasos, Dean of the Faculty of Science and Technology presented on the new programs to be launched in the new academic year. The programs were warmly received! 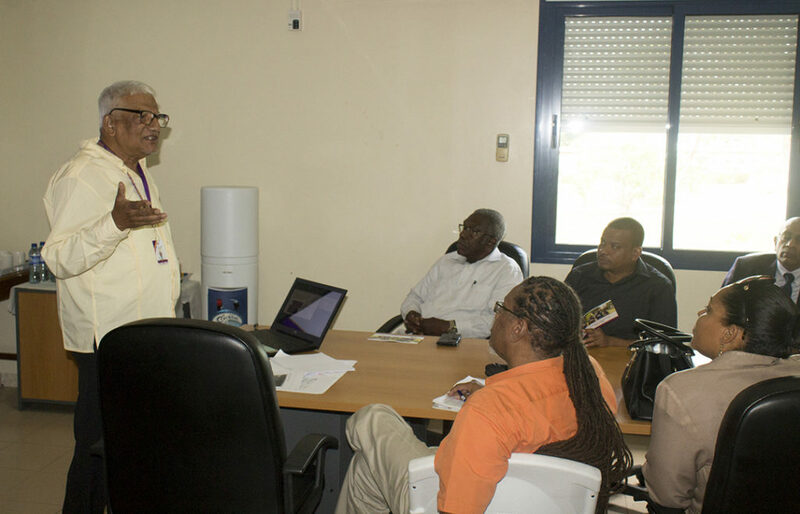 Professor Emeritus Clement Sankat, Board member Mr. Lynn Young, Mr. Ewart Robateau, Special Assistant Inter-institutional Collaboration, International Programs, and Administrative Officer, Ms. Denise Robinson met with senior executives from Belize Bank including General Manager for Business and Retail Banking Services Mr. Desmond Austin. 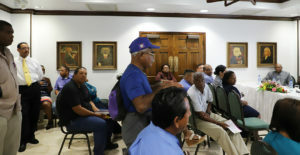 The meeting centered around helping UB in different areas including: student loans and scholarships, new income streams from joint products and support for the proposed UB’s steel band. 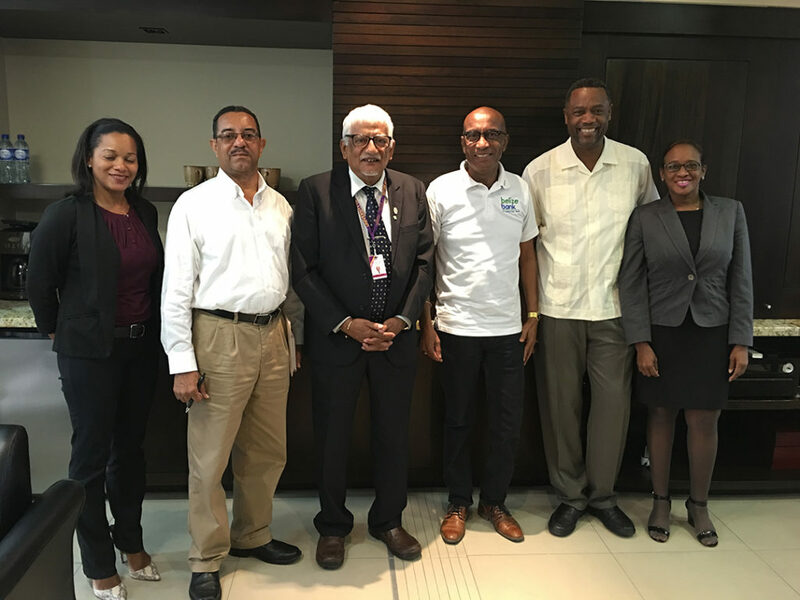 President Sankat thanked Mr. Austin and his team for the time and the interest of the Belize Bank in supporting the University to achieve its transformation. Professor Emeritus Clement Sankat had the opportunity to officially present UB’s Transformational Plan to Hon. Patrick Faber, Deputy Prime Minister & Minister of Education, Culture, Youth and Sports in the Conference Room, UB on May 22, 2018. The President was accompanied by his Senior Management Team including all the Deans and some directors. Hon. Patrick Faber says he is very optimistic of UB’s Transformational Plan under its new leadership team and was looking forward to the day when UB will make the leap. 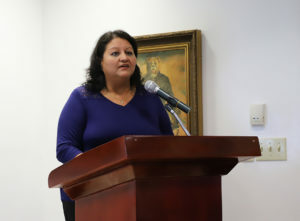 He is committed to supporting the University of Belize more in these financially difficult times, but also emphasized the importance of preserving the autonomy of the University. 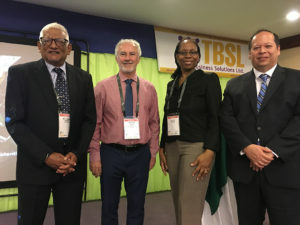 The University of Belize was also present at the Geographic Information System ESRI Conference held in Belize City during May 23-24, 2018. President Clement Sankat at the opening session of the Conference, presented on the role that UB will be playing in development through GIS. He emphasized the role that GIS can play in a national planning framework as GIS can have positive decision making impacts on various sectors of the society. He also noted that has UB already started contributing, by developing a Professional Certificate in GIS. Dr. Santos Chicas and Mr. Antonio Cano, who led the program development, presented during the Conference more on the new program and the benefits the certification will have. The President congratulated them both. Professor Emeritus Clement Sankat met with Mr. Rene Villanueva Sr., Chairman, of RSV Media. They discussed on how the UB and Love FM can work together through a Memorandum of Understanding that supports the University’s communication and marketing drive. It is expected that a mutually win: win MOU will be signed shortly. 1. The 2009-2016 Belize sea cucumber fishery: Resource use patterns, management strategies and socioeconomic impacts published in Regional Studies in Marine Science and can be viewed at https://www.sciencedirect.com/science/article/pii/S2352485517303225. 2. Pearlfish Carapus bermudensis from the sea cucumber Holothuria mexicana in Belize (Central America) published in SPC Beche-de-mer Information Bulletin and can be viewed at https://goo.gl/YaxPws. Dr. Rogers would like to encourage UB Faculty and other UBERI colleagues to continue publishing the results of their research efforts in journals for the benefit of the scientific community, decision-makers and the future of Belize and the world. Her research efforts and publications are as a result of hard hours of field work, data analysis & scientific literature review; the encouragement and positive work environment she greatly appreciates from her colleagues at the UBERI and other marine researchers in Belize and abroad and the tremendous support from her husband Patrick Rogers. Dr. Elma Kay, Administrative Director at ERI, said that they are very proud of Dr. Rogers. President Sankat also congratulated Dr. Rogers on her achievement and encouraged her to continue in the path of research and its publication. The Mathematics, Physics and Information Technology Department has seen the need to instill logic, reasoning, and problem-solving skills to students before they enter the University of Belize. The Information Technology lecturers are now conducting a research which aims to improve the delivery of Computer Science at earlier stages. The title of the research is “Computer Science Unplugged and Pair Programming: Overcoming the Lack of Computer Resources in a Developing Country”. First form students from the Belmopan Methodist High School were introduced to Computer Science and Pair Programming at the beginning of the academic year where they took a pretest to have an idea of their computational thinking skills. During the year they participated in online and offline exercises in computer programming. They completed the course on Friday, May 25, by taking a post test which reflected that combining offline activities and pair programming is as effective as having groups of students sharing a computer and learning through online activities only. The coordinator of the Computer Programming course is lecturer Mr. Dalwin Lewis assisted by his colleagues Mr. David Garcia, Mr. Manuel Medina and Dr. Kieran Ryan. Since 2012, the faculty has been working with the Belmopan High schools and, through the help of the Sacred Heart Junior College, with select primary schools in the Cayo district to help students improve their computational thinking skill set. 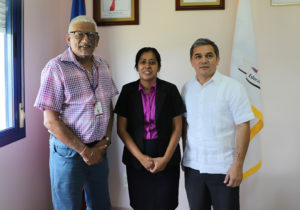 In the following year, the IT faculty plans to help the remaining schools in the Cayo district to deliver Computation Thinking lessons to their students using the same material that has been developed for the past three years. The Mathematics, Physics and Information Technology Department held its second Annual Research for National Development Conference on May 4, 2018. The Research Conference was held under the theme “Fostering Development through Systematic Study”. The students in the Management Information Systems course presented on the different topics they researched on. The Keynote Speaker was Dominique Fabro, Senior ITC Officer at the Central Information Technology Office. The presentations were done in breakout sessions and a total of 29 peer-reviewed research papers were presented by 116 students. The research papers are available at ojs.ub.edu.bz. H.E. 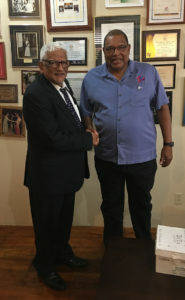 Alexis Rosado, Ambassador of Belize to Guatemala, paid a courtesy visit to Professor Emeritus Clement Sankat on May 25, 2018. The meeting centered around the education campaign to be launched on the Belize/Guatemala issue and the role UB can play in the educational/outreach matter. H.E. Rosado was accompanied by Director of International Affairs (Cooperation) Mrs. Orla Kantun-Coleman. President Sankat commended Mr. Noe Agreda on his appointment as Acting Director for the Regional Language Center. Noe Efrain Agreda, has an Associate degree in Music and another one in French Education. He also has a Bachelors in Education, and another one in Teaching French as a Second Language (FLE). He then completed two Master degrees; the first one is in Social Sciences, with emphasis in FLE and the other in Andragogy. His vision for RLC is to align it to the Transformational Plan. He plans to restructure the Certificate in English as a Second Language (ESL) to respond to international standards and to be internationally transferable, all in meeting the demands of the marketplace. Additionally, the Center is developing a Mandarin Program for open courses and UB Elective courses, a Spanish for Public Officers program, a Spanish Language, Culture and Civilization program; One-on-One courses for different languages; ESL Program for United Nations; Open Courses in ESL, SSL, FLE and other languages. There are also plans of opening satellite sites of RLC in Belize; developing a beautification program, and exploring opportunities beyond our borders, among other ideas to be developed. He concedes it is an ambitious plan but he is confident the RLC will do well.